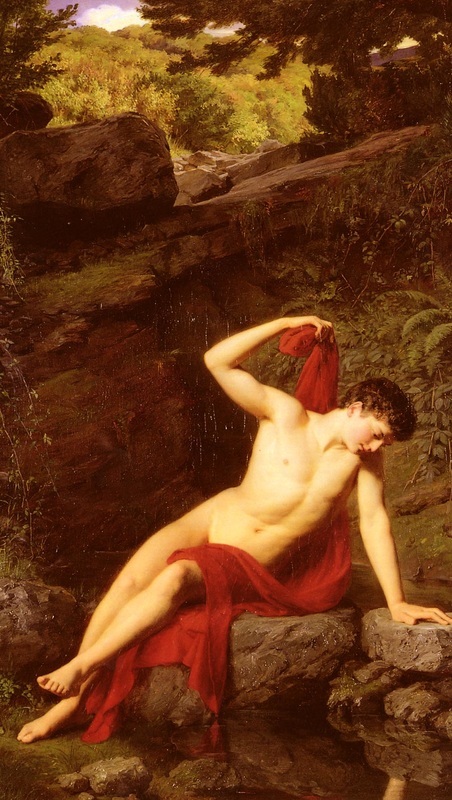 The Story of Echo and Narcissus is one of the most enduring tales from Greek mythology, and the tale of self-love and unrequited love is one which has been told and adapted over many hundreds of years. Echo was an Oreiad nymph from Mount Cithaeron in Boeotia. The parents of the mountain nymph are never made clear, but she was educated in music by the Younger Muses. Beautiful in her own right, Echo was chased by both Apollo and Pan, but would shun their advances, and although Zeus did not chase after Echo, he made use of the mountain nymph. 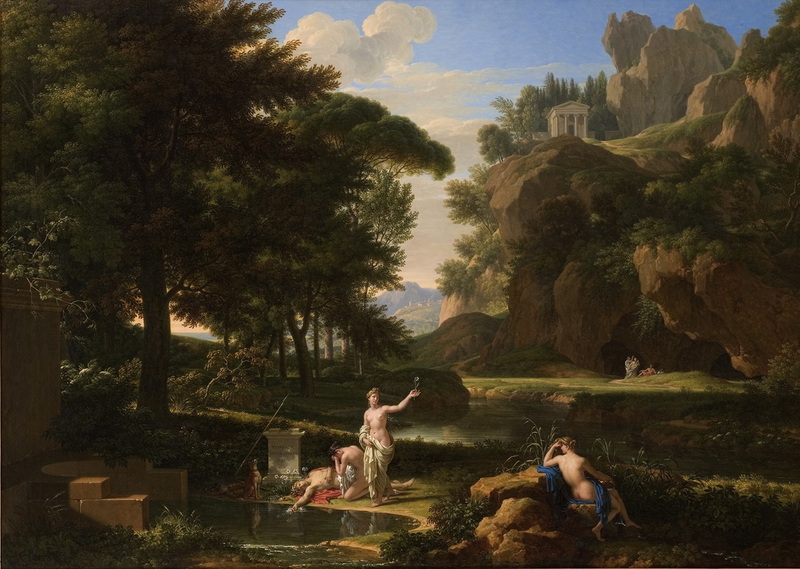 For whilst Zeus would have his way with other nymphs, Echo would talk for hours with Hera, distracting the goddess from Zeus’ indiscretions. Hera would eventually recognise the role Echo was playing in enabling her husband’s affairs, and so Hera cursed Echo so that she no longer had a voice of her own, and the nymph was only able to repeat the words of others. Narcissus was a handsome youth from the city of Thespiae in Boeotia, and was generally considered to be the son of the Potamoi Cephissus and the Oceanid Liriope, although occasionally Narcissus was named as the son of Endymion and Selene. When still a child, the blind seer Tiresias made a prophecy that Narcissus would lead a long life only as long as he did not “know himself”, although the meaning this is not altogether clear. It might be translated to mean that Narcissus was not to look upon himself, which fits in with the downfall of Narcissus, but equally might be taken to mean that Narcissus had to remain humble. Narcissus would grow up to be amongst the most beautiful of all mortals, with a beauty on par with that of Endymion, Adonis or Hyacinthus. Narcissus would become a deer hunter, but his beauty brought forth many admirers both male and female, and mortal and immortal. One of the admirers of Narcissus was Echo, for after being cursed by Hera, the Oreiad had wandered through Boeotia, and had glanced the youthful Narcissus whilst he hunted, falling immediately in love with him. With no voice of her own, Echo could not call out to Narcissus, but eventually the Thespian senses that he was being watch, and called out. Echo could not respond to the question “who’s there?” and could only repeat the words of Narcissus. Eventually though, Echo left her hiding place and came face to face with Narcissus. Narcissus was incapable of loving anyone but himself, and Echo was cruelly rejected. Echo fled back into the mountain woodlands, and faded away leaving only the remnants of her voice behind. Echo was just one of a number of spurned lovers, for a tale is also told about the rejection of Ameinias, a fragile youth who had also fallen in love with Narcissus but was also spurned. Ameinias would take the rejection as badly as it could be taken, and the youth would commit suicide in the doorway of Narcissus’ home, killing himself with a sword that had been given to him by Narcissus. 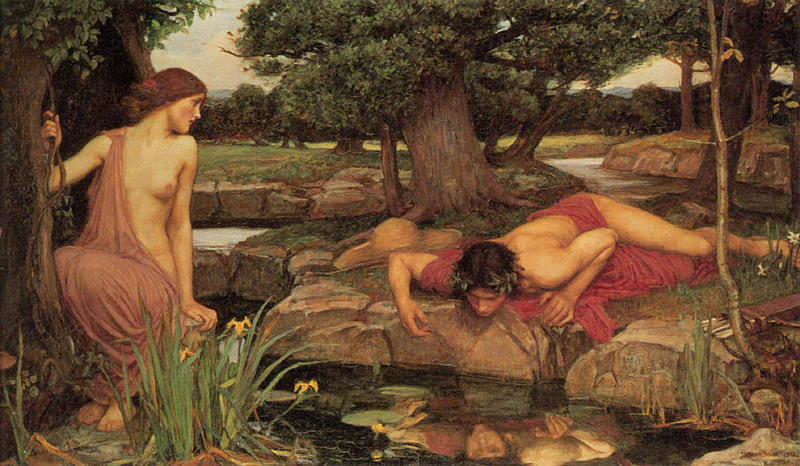 Some say it was Ameinias who called upon the vengeance of the gods upon Narcissus, whilst others say it was one of the multitude of rejected nymphs who prayed to the gods. In either case, Nemesis, the Greek goddess of Retribution heard the words, and observed the callous rejection of others by Narcissus, and intervened. When Narcissus came to a pool in Thespiae to drink from its water, the youth saw his own reflection in the pool, and fell in love with it. Narcissus was unable to obtain the object that he had fallen in love with, just as so many suitors of Narcissus had been rejected. Narcissus would die of sorrow by the pool, despite the pleadings of the Naiads and Dryads who had observed Narcissus wasting away. A funeral pyre was built for Narcissus by the nymphs, but when they came to place the body of the handsome youth upon it, they could not find it, as all that was left was a flower, the Narcissus flower. An alternative version of the death of Narcissus sees the Thespian youth recognising the unrequited love that he has for his own reflection, and now brutally aware of the pain and suffering that he has caused to so many, Narcissus falls upon his own sword, just as Ameinias had done.